Caledonia Mining Corporation (CALVF) - At Low End Of Bollinger Band - Buying Opportunity? Caledonia Mining Corporation (symbol: CALVF) is currently trading near the bottom of the bollinger band and in normal conditions may now be ready to head back toward the middle of the bollinger band. This is another look at the chart of Caledonia Mining Corporation since the chart the was published recently. The slow stochastic is also over sold and has just crossed over which is a bullish signal. Caledonia Mining operates the Blanket Gold Mine in Zimbabwe and is a profitable gold mining corporation that pays a quarterly dividend. Caledonia is in an unstable country politically which reduces it's share price because of risk. For example Caledonia had to give up control of the company to the Zimbabwe government due to the indigenisation laws. Caledonia Mining produces gold at profit and a rising gold price would theoretically help the common stock price. Today, Hi Tech Supplements announced that it has started a new website devoted to the sale of Hi Tech dietary supplements. Hi Tech Supplements are extremely popular dietary supplements in the United States as well as internationally. With the start of our new website we hope to become the online leader in sales of all Hi Tech dietary supplements. Hi Tech manufactures and markets a diversified lineup of products including supplements for weight loss, energy, sexual enhancement, muscle, strength, nutritional health, vitamins, sleep, heart, liver and much more! Our starting lineup of products includes the entire family of Fastin Diet Pills. The four types of Fastin supplement are Fastin tablets in a 60 count bottle, Fastin XR extended release capsules in a 45 count bottle, Fastin Rapid Release caplets in a 45 count bottle and Fastin Multi Vite For Her in a 120 tablet bottle. As sales grow we intend to expand our collection of Hi Tech Supplements to include supplements such as HydroxyElite, Stimerex, Lipodrene, Black Widow, Yellow Scorpion and many others. For more information on our company and our new website, please visit us at www.hitechsupplements.com. Caledonia Mining Corporation (stock symbol(s) CALVF, CA:CAL) is trading down near solid support area. Taking a look on the long term chart of Caledonia Mining shows that it may be nearing an oversold level from where it may look to move higher longer term. Not only has it tested support levels many times in this area, but the Slow Sochastic has just crossed over and may now look to start moving back up. This would likely lead to higher share prices in the future. Caledonia Mining Corporation is profitable with positive cash flow and a healthy balance sheet. Even better, Caledonia Mining pays a quarterly dividend. Caledonia operates the Blanket Gold Mine in Zimbabwe. To learn more about Caledonia Mining, please visit the company website at www.caledoniamining.com. Tanzanian Royalty Exploration company which is run by the famous Jim Sinclair is currently at its most oversold levels ever. This is all while they continue to move toward production at the Buck Reef project in Tanzania. Visiting the company's website you will find that they are updated their progress in pictures rather than words at the moment. There are recent updates on the website frequently and you can see the progress they are making toward production. This includes areas currently being mined, heap leach pads being constructed, material being placed on heap leach pads, gold room being built and set up, cyanide processing equipment and so forth. Taking a look at this long term chart you will see that by certain measures, this stock is extremely oversold and may be due for a nice run higher in the near future. If the price of gold continues to move higher in the near term, Tanzanian Royalty looks to benefit as currently it is a hated stock and being priced at lows not seen in a long time. To learn more about Tanzanian Royalty Exploration Company, please visit their website at www.tanzanianroyalty.com. Greensations has officially launched a new coconut toothpaste that is all natural and made from coconut oil, baking soda and spearmint. The new product, called Cocodent, is currently selling on Amazon.com and Ebay.com as well as Greensations.com. According to the Greensations website, Cocodent is the world's first commercial Coconut Oil Toothpaste with Baking Soda and Spearmint Oil. This unique natural combination cleans and whitens teeth, freshens breath and promotes gum health.This is the safest and mildest toothpaste you'll ever use and it works like a charm with no added chemicals, binders or sweeteners. This formulation is based on a very old recipe from our founder's Grandmother, a registered nurse who also worked with natural remedies. It's fabulous for everyone including adults, kids and even pets. Studies show coconut oil prevents tooth decay while promoting whiteness without the side effects of commercial toothpastes that are filled with chemicals such as fluoride. Greensations is a small company located in Scotia, New York. It's founder and owner, Wayne Perry, is the inventor of the popular nasal spray called Sinus Buster. Wayne and his products have been featured on the show Dr. Oz as well as other popular media shows and magazines. 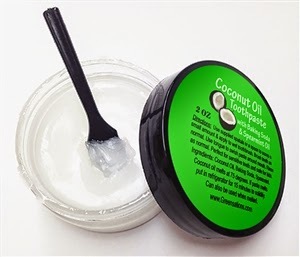 For more information regarding coconut oil toothpaste please visit the company's website at www.Greensations.com or call the company directly at 855-233-8995.